The image to the left may not seem very hockey-centric, but it most certainly is. That's why we're here today. The gentleman on the right in the picture is named Matt. Matt contacted me regarding the article I wrote on the Preston Rivulettes entitled Linking To Genius. He had some nice things to say about the article which I appreciated, but Matt's grandmother was most impressed. Matt's grandmother, seated on the left in the picture, is named Ruth Collins, née Dargel, and she was one of the Rivulettes in the 1930s! Matt put me in contact with her, and we had an hour-long conversation last week. On behalf of HBIC, I am extremely honoured and proud to bring to you Ruth Dargel's story, and her legacy with the Rivulettes. When we began talking, and it was immediately clear that Miss Dargel was proud to be a Rivulette. While she was too young to be around during the formation of the Preston Rivulettes, Ruth Dargel joined the team in 1937 at the tender age of 15. Amazingly, she didn't get her break because of her hockey talents. Instead, she was a recruit for the softball team! Miss Dargel's father coached a Waterloo softball team that featured the up-and-coming athlete. Ruth was tossing the ball around when a man approached her father asking if she was interested in playing on a better team at a higher level. Knowing that her daughter, as athletically-gifted as she was, needed a bigger challenge, Mr. and Mrs. Dargel decided to allow Ruth to make the trek to Kitchener to play for the Seagrams softball team. In order to do so, however, she needed to get a temporary work permit to allow her to work in the Seagrams Distillery in Kitchener, Ontario at age 14 in 1936. Her job? Cleaning bottles. The summer months were all about playing softball when the ladies weren't at work, and this is where her association with the Rivulettes began. While their softball feats were not as widely recognized as their hockey prowess, the Preston Rivulettes softball team was equally impressive in terms of their talent. The women would work at the Seagrams Distillery during the day, and then play softball in the evenings and on weekends to big crowds. If that image isn't straight out of the Hollywood movie A League of Their Own, then it's certainly one for a female version of Field of Dreams. With the winter months nearly on the region, Ruth was anxious to hit the ice. Earlier in her childhood, she had been a very good speed skater, and took up hockey as a hobby and way to practice skating when her dad built a rink in the backyard for her brother to play on. Ruth's speed and skating ability made her a great skater, but her brother and his friends refused to allow her to play in games with them because of the rather large speed skate blades on her feet. Her brother begged her dad to get her some hockey skates so that there wasn't this fear of blades any longer, and he finally gave in. With the smaller blades, cornering was much easier now, and Ruth's talents with the puck started developing rapidly. "My brother and his friends wouldn't let me play with them on the rink," Ruth informed me. "They were afraid of my skates. But once I got on those hockey skates, let me tell you, hockey was a lot easier." Because of her annual rite of winter out on the backyard rink, Ruth was a fairly good hockey player by the time she joined the Preston Springs softball team. Her mother had mentioned to the Seagrams people that her daughter could play hockey. Knowing that the softball ladies played hockey in the winter, the Seagrams' coaches put Ruth Dargel on the Preston team at age 15. Her skating abilities allowed her to keep up with some of the older ladies on the ice, and her decent stick-handling and puck moving abilities that she had learned on her own backyard rink began to shine through. Ruth Dargel was made part of the Rivulettes for the 1937-38 season. While the Rivulettes already had an impressive history behind them by the time 1938 rolled around, Ruth Dargel was added to the amazing history that these women were writing. They were Ontario Champions a number of times by the time Miss Dargel joined the team, having won seven championships by 1937. The highly-decorated team began traveling more extensively as the stories of their records gained strength throughout Canada. Unlike the teams of today who are sponsored while traveling, the ladies paid for all their travels out of their own pockets, and normally traveled by car. Their trips to Edmonton, Winnipeg, and northern Ontario took them through some of the most harrowing winter weather - snow, ice, frigid temperatures - just to play hockey against the prairie teams. In 1939, the Rivulettes were invited to Prince Edward Island to play against the best women's team from PEI for the Dominion Championship, and stayed in the same hotel that King George VI and Queen Elizabeth stayed in during their royal tour in the summer of 1939. Pretty impressive for an amateur women's team, right? "The hotel was a dump," Ruth recalled. "It was really run-down. I'm surprised that the King and Queen stayed there during their visit." The ladies didn't let their old-fashioned hotel ruin their trip, however. According to Ruth, the ladies bunked like current hockey players do: the same teammates would bunk on the road together when the traveled. Ruth bunked with teammate Violet Hall on the road. The game between the PEI Islanders and the Preston Rivulettes in 1939-40 was for the Dominion Championship - female amateur hockey's Stanley Cup at the time. The Rivulettes, having won five straight Dominion Championships, were the favorites coming in. The Saturday night game between the two teams saw Preston Springs take a 1-0 lead in the series with a 4-2 victory. Game Two on Sunday saw Ruth Dargel, now a 17 year-old forward with the Rivulettes, shine in the spotlight of the biggest game of the year. The Rivulettes jumped out to a 3-0 lead through two periods on goals by Hilda Ranscombe and a pair from Gladys Pitcher. At 3:10 of the third period, Vimy Jones fired a high shot past Nellie Ranscombe after a scrum around the net to bring the Islanders closer at 3-1. Our star, Ruth Dargel, scored her first goal of the game off a rebound in the third period. Islanders' goaltender Myrtle McDonald made a couple of fine saves before Dargel buried the puck from in front of the net to increase the Rivulettes lead to 4-1. Hilda Ranscombe netted her second of the game to increase the score to 5-1 before Marm Schmuck tapped in a Hilda Ranscombe feed at the side of the net to make it 6-1. Dargel's second goal of the game sealed the deal as she stripped an Islanders player of the puck and skated in alone against McDonald. Dargel fired the puck over McDonald's shoulder as she broke in on the goalie, and the Rivulettes earned the win, and their sixth consecutive Dominion Championship, with a 7-1 victory. Dargel, seen here on the right with goaltender Nellie Ramscombe, celebrated her third championship in as many seasons. With the outbreak of World War I, a European exhibition trip to play some of the men's teams in Europe was cancelled. Because of the war-time measures put into place, changes to the Preston Rivulettes were inevitable. Many of the women were married or soon-to-be married, and Miss Dargel was no different. She met a young man who was in the Canadian Air Force, and they were soon married. Because of his work, the newly-named Ruth Collins traveled to many new places, eventually ending up in Moose Jaw, Saskatchewan at the Air Force base. Her love of hockey didn't die in Preston Springs, though. Through some efforts with the people on the base, Mrs. Collins formed a loose team in Moose Jaw and they played regularly on the base against one another and against local teams. It wasn't until the late-1940s, after three children were added to the Collins' family, that Ruth hung up the skates in terms of her playing days. She still has her old skates, and still used them to ice skate in the winter when she could well into her septuagenarian years. That, to me, is absolutely amazing! Before I sign off, I do have a couple of people to thank. 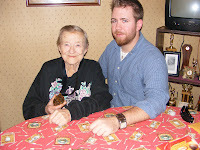 I want to thank Matt for allowing to get in touch with his grandmother. Matt was the driving force behind this story in terms of having me tell it, and, without him, this never would have come to reality. Thank you, Matt. I am truly grateful for the opportunity you gave me to speak to your grandmother. I also want to thank Miss Ruth Collins. Miss Collins, your story is not only impressive to hear, but it is inspiring. You are literally a living part of hockey history, and I truly believe that your inclusion into the Hockey Hall of Fame should be highlighted even more than what I have done. I will be following up your story in the weeks to come with some of the contacts you provided to me, and I will contact you with the updates. Thank you for taking the time to speak to me about your experiences, and it is an absolute honour and privilege to be able to tell your story to the world. Thank you! Just before I close off this section of amazing hockey history, here are the Preston Springs Rivulettes from 1938, shortly before competing for their eighth straight Ontario Association Championship. The blond-haired lass on the extreme left in the second row is Miss Dargel at the age of 16. This is the team that would essentially compete until their disbanding in 1940. Here is another newspaper clipping regarding the Rivulettes' amazing run in regards to their unfathomable record of 350-2-3. And here is a great newspaper article from the Cambridge Times in 1991 that gives an excellent overview of the Rivulettes' successes. Hockey history is pretty darned cool, isn't it? Wonderful article. Even better with the photos. They wore some beautiful uniforms in the 30's. I was interested to hear there was a team called the 'Islanders' before the team on long island. Anon - it is my pleasure to share it. I really feel that the story of the Rivs needs to be told. Eric - the pictures were all from Matt and Miss Collins. Considering the age of the photos (nearly 80 years old), they are fantastic! The story of the Rivulettes is one that I have gotten to know well. A few years ago a friend wanted to start a new competitive womens team in Calgary, AB and a neighbour found her a book on the history of womens hockey in Canada. After reading the book she knew that she wanted people to know about the Rivulettes and decided it was the perfect name to use for our new team. Our team has tried to honor the original team. Our team website tells the story of the Preston Rivulettes, my goalie helmet bears the original Preston logo on one side and our newer logo on the other, and we hope to one day be able to purchase the original Preston Rivulettes jerseys to use as our third jerseys. I was excited to find out that there are living members of the team. We hope that they see our team as one that properly honors their legacy and brings attention to this historic team. I was so very happy to find this story. I am so very proud of all the players and I have a personal connection. My grand parents were Marvin Dykeman and Olive Dykeman who were the Manager and Chaperone for the team. I really regret never having spoke to them about their experiences over this time. I wish they would do a movie about this group similar to what they did in "A league of their Own". Thanks again for writing a fantastic piece.